I guess by now, most people in Forest Knolls have some idea that big changes are planned for the forest behind our neighborhood. Essentially, UCSF plans to cut down over 90% of the trees on three-fourths of the forest, and remove 90% of the undergrowth. The only bit to be spared would be 15 acres or so of steep hillside on the western side, above Inner Sunset. UCSF is having a hearing on Feb 25th at 7 p.m. (They sent around postcards about this.) It’s at the Milberry Union, 500 Parnassus, CA 94134. If you can attend, please do, and speak up. If there’s a big turnout, they may limit each speaker to 2-3 minutes, so have your points ready. 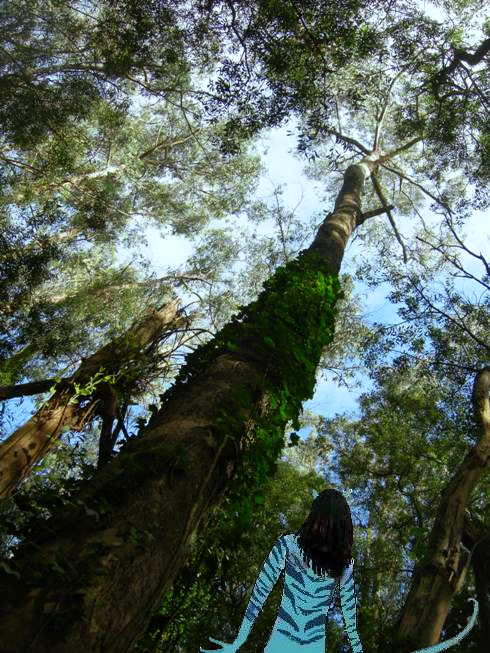 Environmental impact – (eucalyptus is the best tree species for sequestering carbon because it grows fast, large, is long-lived, and has dense wood; but felled and mulched trees release this carbon right back into the atmosphere). The implementation would be in two phases; it would start with the “demonstration” plots, around 7.5 acres in Phase I. The largest of these, #1 in the map is a 3-acre strip directly above Forest Knolls. Most of the trees would be cut, and tarping or pesticides used to prevent resprouting. Later, UCSF would extend the same plan to the entire forest (except for the 15 acre piece mentioned). The article below has been copied with some modifications from http://www.SaveSutro.com, which is a website set up to inform people about Mount Sutro Cloud Forest and to defend it. 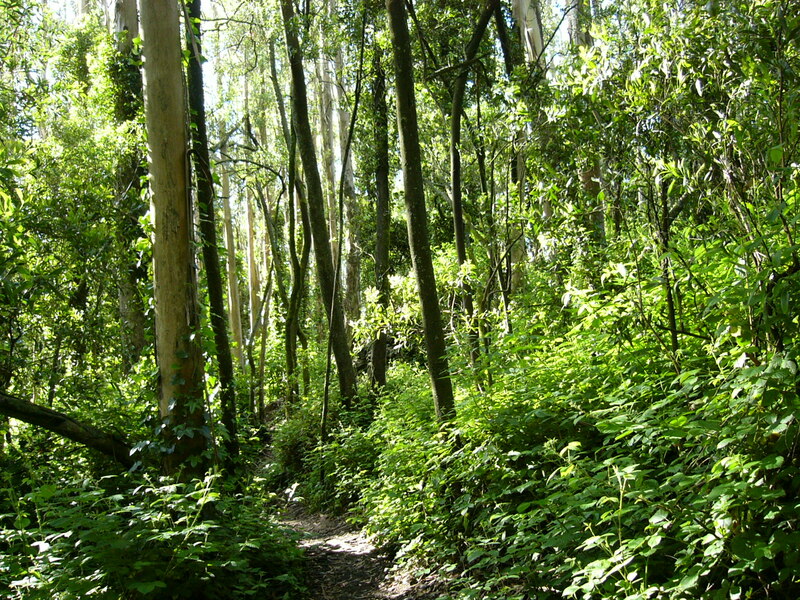 Mount Sutro Forest has approximately 45,000 trees in the 61 acres belonging to University of California, San Francisco (UCSF), and designated as an open space reserve. This dense forest, with an estimated 740 trees per acre, a sub-canopy of acacia, an understory of blackberry and nearly a hundred other plant species, is functionally a cloud forest. All summer long, it gets its moisture from the fog, and the dense greenery holds it in. Where it isn’t disturbed, it’s a lush beautiful forest, providing habitat for birds and animals, and a wonderful sense of seclusion from urban sounds and sights. UCSF now has published a Draft Environmental Impact Report (DEIR) on a project to remove over 90% of the trees on three-quarters of the area. Only 15 acres – on the steep western edge of the forest – will remain as they are. Tree-felling could start as early as Fall 2013. On most of the forest (44 acres), UCSF plans to cut down trees to achieve a spacing of 30 feet between trees – the width of a small road – and mow down nearly all the understory habitat. On another 2 acres, they will space the trees 60 feet apart. The stumps of the trees will be covered in black plastic, or else poisoned with Garlon to prevent re-sprouting. Eventually, this will kill the roots, which will start to decay. We’ll address some of these issues in more detail in later posts. The project is to be implemented in two phases. In the first phase, trees will be felled and the understory removed in four “demonstration areas” totaling 7.5 acres. They are shown on the map below in yellow, as areas #1-#4. 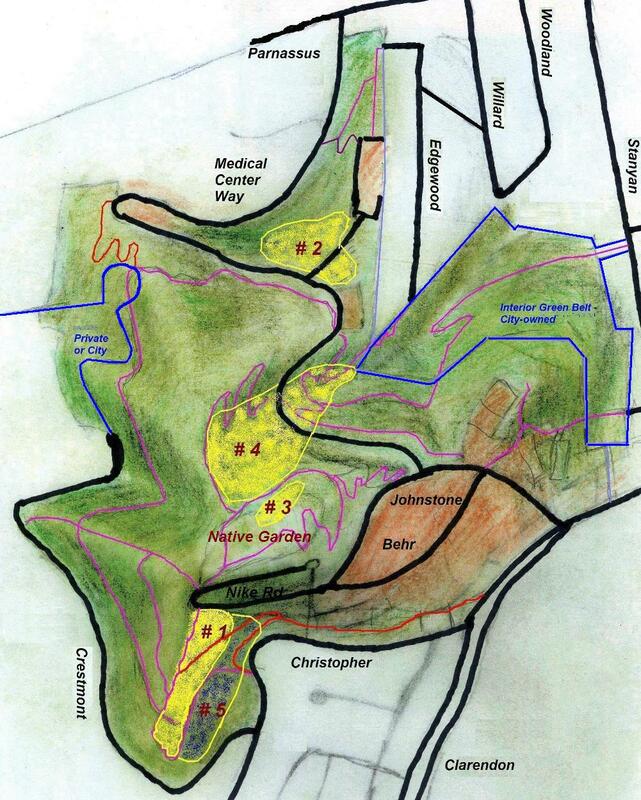 [The 3-acre area #1 is right above Forest Knolls.] One of these, #4 “East Bowl”, is the two-acre area slated to have only 12-15 trees per acre. 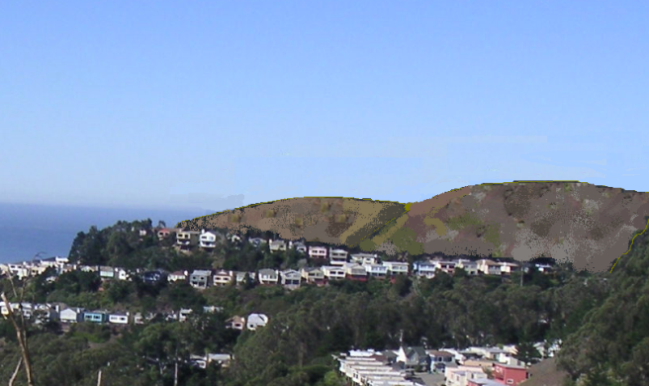 Digitally-altered image – Forest Knolls without Sutro Forest. Maybe there’ll still be some trees left after this Plan is implemented. No forest in Forest Knolls? Toxic chemicals in our yards and streets? People and tour buses parking on our streets 24 hours a day to go up to the “new twin peaks”? New crappy 34-unit development clogging the streets with 100 more cars? Does anyone else see our property values plummeting? Our neighborhood changed beyond recognition? Anything else to wreck our neighborhood possible? Everyone brokering the above propositions want to just ruin what is and move on – they don’t live here. All of these projects must be protested and at least downsized. What is the reason for this draconian culling? Why 900 sqft per tree? Why not a more reasonable 100 sq ft/tree? Anyone have any ideas why this is so draconian? Very sad. There is most certainly a lot of money driving this, no respect for the tiny bit of wild left here. I am going to protest the ruining of the forest. Please get involved. 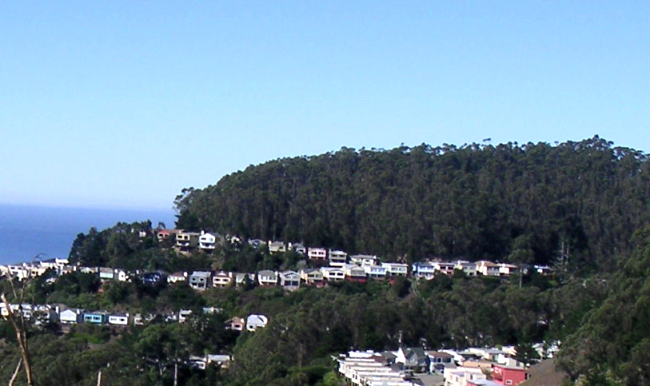 I absolutey agree with the plans of the university to restore Mount Sutro. I do live in the neighborhood. My family has lived in the neighborhood since it was built after WW2, and have lived in San Francisco for what is now our 6th generation. We were here before Sutro Forest was planted, and we will be here long after the restoration will bare it’s fruits. I am far less concerned with property values (considering that we intend on staying in the neighborhood; hopefully for centuries to come) and have no intention on selling our home and moving to some other state were we have no knowledge of the indigenous flora and fauna. I inharetted from my family the knowledge of the names of the plants that are intended to replace the Eucalyptus groves. I know that what is proposed comes from an understanding of the local biology and science, not greed or some alterer motive. This project comes at a price, a sacrafice to nature. It isn’t as if the removed trees can be sold as lumber; they can not. I beleive the spirit of the author is genuine and with good intention, but doesn’t from education, rather it comes for sentimentality and an emotional motivation as apposed to a real understanding of the local enviornment, the local community, and the natural sciences. For example, did you all know that native bird species are threatened by the Euctalyptus? Their short beaks and nostrals get clogged in resins and in turn the birds sufocate when they eat from the sweet bloosoms of the trees. It is not uncommon to find dead birds under the Eucalyptus canopy.